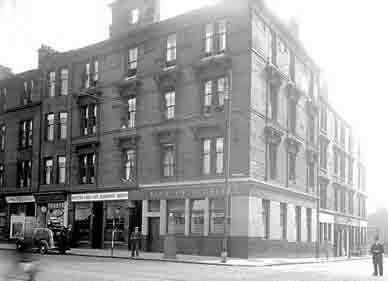 Archibald Barr’s premises at the corner of Gallowgate and Soho Street. Even up to last week there was no let-up in his hectic schedule of late. He was among the guests at a victuallers’ dinner in London and a couple of days later he was up at the crack of dawn in his Troon home before making a flying one-day visit to the Carlsberg brewery in Northampton. In fact, he had hardly learned how to pull a pint before he was involved in the veto polls of 1920. “Little did I imagine that when I canvassed our neighborhoods that 51 years later we would still be faced with this threat to livelihoods,” he said. Morris Barr might never have had entered the trade full-time had it not been for his father’s death in 1927, only three days before he was due to sit his C.A. finals. He never did sit them, as the trustees of his father’s estate then persuaded him that there was more money to be made in the licensed trade than accountancy. “Of course, I was next to the cattle market so there was never really a quiet moment,” he remembers. Needless to say, he once had a bull in the shop, “tethered to his owner, not a runaway,” he hastened to add. He had rats, burglars and even people who had been locked in, but one unwanted visitor to the premises stands out above all others. Mr. Barr sold the Belgrove shop in 1964, and then, with three fellow directors, formed a company which took over The Snug Bar at Airdrie Cross. Modernised and extended. The Snug became one of Airdrie’s most successful shops. By then Mr. Barr was no longer actively involved in the day-to-day work. The Snug was finally sold, just three months ago. His interest in the “Scottish” goes back to the fifties. He was appointed to the Managing Committee in 1953 and then was elected to the executive in 1964. Thereafter he climbed the ladder as junior and senior vice-president before taking office as president at Ayr in 1972. He has served on the Wages Board and Brewers’ Liaison Committee for some years. A former director of the Scottish Wine and Spirit Merchants’ Benevolent Institution, he is also a director of the Scottish Veto Protection Company. And even with these commitments he has still found time to be a member of the Incorporation of Rights, Trades House, the Scottish Furniture Trade Benevolent Institution, Dennistoun Rotary Club and the Eastern Merchants’ Association. A. Bischoff, agent, 112 Bath Street. R F Barr, Aerated Water Manufacturer, Great Eastern Road. Robert Brown, Wholesale Blender and scotch Whisky Merchant, 17 Hope Street.